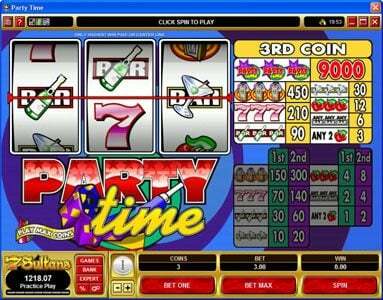 Party Time online slot machine pictures and slot feature list from Microgaming, play Party Time Slots for free. Party Time Slots has not been reviewed yet, be the first to rate this slot. Party Time is a 3 reel, single payline classic that has been created and developed by Microgaming. This game also comes with a maximum jackpot that can end up being as much as $45,000.You will be able to strut your stuff and get down to boogying in this crazy partied theme slot. The atmosphere of this game is very light hearted and it meant to provide you with some fun filled entertainment. You will see slot symbols like the jukebox, A Bar symbol with a champagne bottle, Cherries, the party time logo and a Bar symbol with a martini drink. The symbols resemble the theme of this game perfectly which makes the theme of the game more authentic. 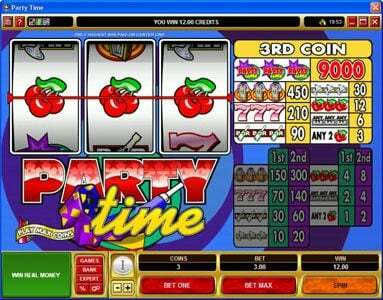 You will have a good amount of wagering methods when it comes to the Party Time slot game. You will have the option to wager anywhere from $0.25 to $5 per coin. You will be able to wager three coins per spin in this slot game. This means that the maximum wager for this game is $15. The higher the amount that you wager means the higher the payout you will receive when you land on a winning combination. This game might not seem like the most thrilling game you can play online because there isn't any wild symbols or any Bonus features. This is because Microgaming wanted to create a classic slot game that was 100% accurate to a real classic slot game. Even so if you land on a good winning combination in this game you have the potential to win an incredible amount of money. You could even win the jackpot which is worth a lot of money. This game has reached the high expectations that we have gotten over the last ten years of Gambling. We know what it takes to make an amazing classic Slot game and Party Time does it perfectly. We highly suggest you start playing this game immediately because you will not regret it.